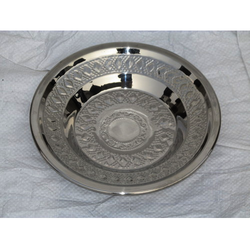 JAIN METAL & STEEL INDIA is popular for its offering in stainless steel soup plates that come in various designs and customized form. Our high quality designs speak volumes about our taste in the latest world fashion and designing. Sold in various elegant and intricate forms, we have a large range of choices at our hand. 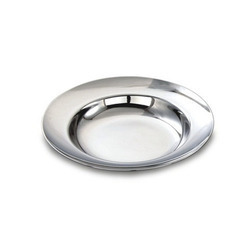 Serve food in style on this finest quality stainless steel round-serving platter, which is available in different sizes. Serving plate features mirror finish and is easy to clean. Note : Prices are negotiable. U like exports is popular for its offering in stainless steel soup plates that come in various designs and customized form. Our high quality designs speak volumes about our taste in the latest world fashion and designing. Sold in various elegant and intricate forms, we have a large range of choices at our hand. We are offering Stainless Steel Soup Plate to our clients. We have in stock for our clients a quality range of Soup Plates, which is widely appreciated by the clients for its innovative designs and exquisite shapes. These are made using quality stainless steel, which ensures crack resistance, high tensile strength and impeccable finishes.